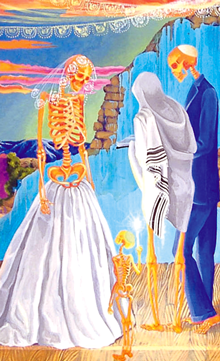 Influenced by Mexican Day of the Dead art, this painting by Anita Rodriguez depicts a Jewish wedding scene. Artist Anita Rodriguez's "aha" moment came after reading "To the End of the Earth: A History of the Crypto-Jews of New Mexico." The 2005 book by New Mexico's former state historian, Stanley Hordes, tells the story of the Southwest's Converso settlers and the elements of their Sephardic heritage - among them lighting candles on Friday night and refraining from eating pork - that were passed down over 500 years. "Growing up in Taos, I quickly learned that it was taboo to ask people about their religion," she told JTA. Rodriguez is one of several artists planning to exhibit Crypto-Jewish-themed paintings and folk art at the conference of the Society for Crypto-Judaic Studies to be held July 22-24 in Albuquerque. "Artwork makes people want to know more about their own identity," said Dolores Sloan, president of the society, which helped obtain grants to bring artists to the conference. After reading Hordes' book and researching Jewish life, Rodriguez began painting Southwestern- and Mexican-influenced scenes of the secret Jewish lives that she imagined her neighbors' ancestors had practiced. In one work she calls "nichos," a takeoff on a traditional Latin American form of folk art, Rodriguez uses painted wooden boxes created from kiln-dried wood. Painted in a folk art style with brightly colored acrylic paint, the boxes, which have two hinged doors, reveal what she sees as the duality of the Crypto-Jewish life. For example, on one nicho, a Christmas Eve scene is shown with people streaming in to the village church. Open the box's doors and painted on the inside is a skeletal Jewish family seated at a table with a lit menorah. "There are some truths that can only be spoken in the voice of art," Rodriguez said.